Gabriele Klosner, Robert Knobler, Franz Trautinger and Peter Neuner. 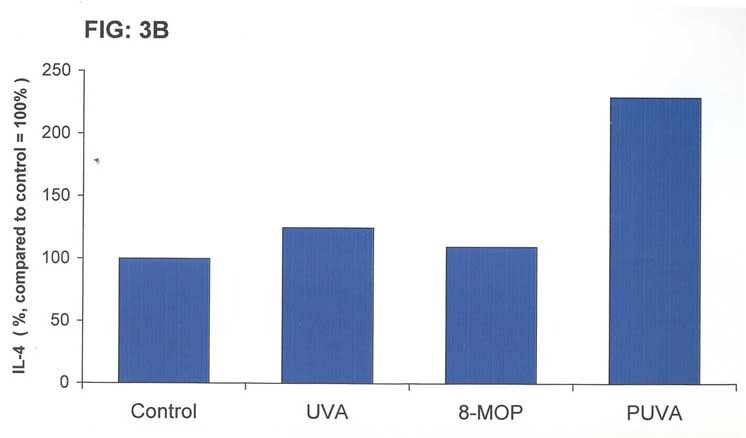 Treatment with 8-methoxypsoralen (8M0P) plus UVA (PUVA) has been shown to be beneficial in inflammatory as well as in malignant skin disorders such as psoriasis, graft versus host disease or cutaneous T-cell lymphomas. Since the ratio between interferon-gamma (IFNg) producing TH1 and interleukin-4 (IL-4) producing TH2 cells appears to be critical for the progression of skin disorders, the effect of PUVA on TH1- and TH2-cytokine production was investigated. 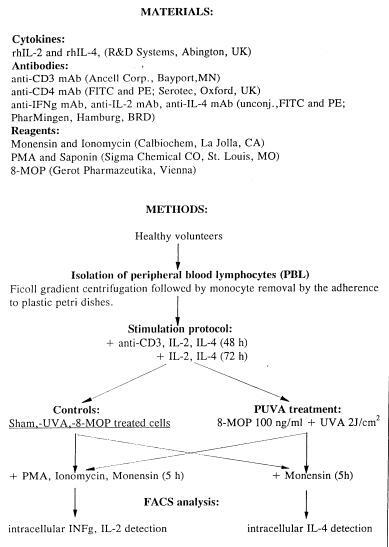 Peripheral blood lymphocytes (PBL) derived from 6 healthy volunteers were stimulated and treated as described in material and methods. 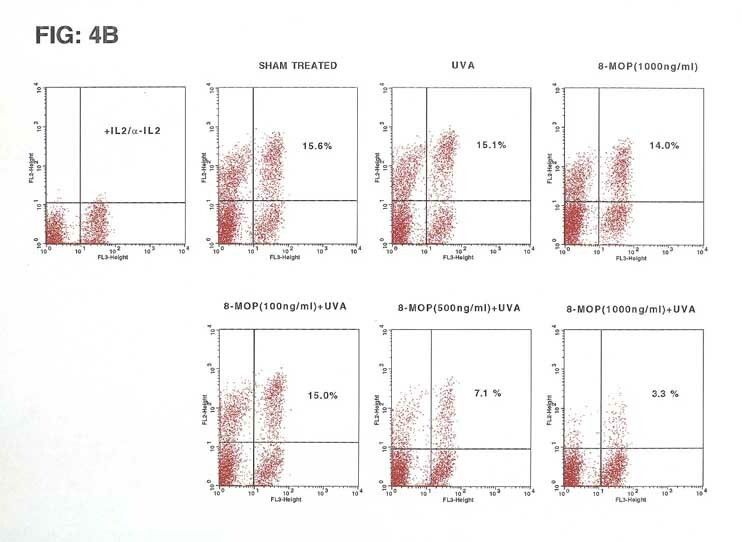 FACS analysis revealed undetectable amounts of INFg and IL-2 in unstimulated CD4+ cells. However, upon stimulation with PMA and iononmycin, CD4+ cells showed a distinct production of IFNg and IL-2 that was significantly downregulated by PUVA treatment. IL-4 production was detected in unstimulated as well as in stimulated cells. In contrast to IFNg and IL-2, PUVA treatment significantly upregulated IL-4 production. Intracellular INFg, IL-2 and IL-4 production by PBL. PBL were stimulated with anti-CD3 mAb, IL-2 and IL-4 for 48 hours, washed and subsequently stimulated with IL-2 and IL-4 for further 72 hours. 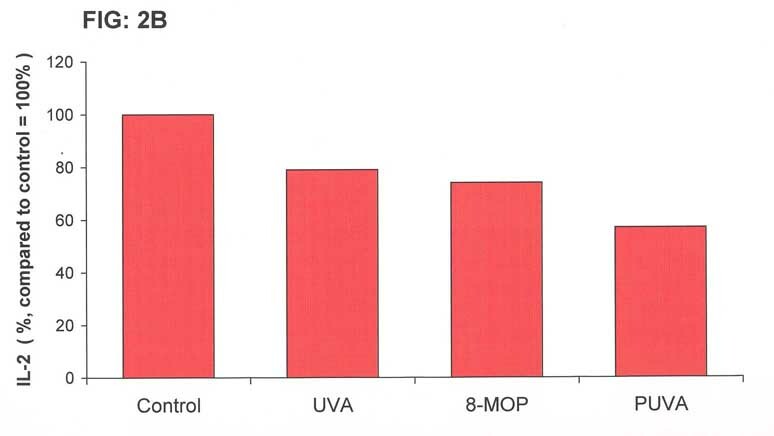 After washing, cells were incubated in the presence of 8-MOP (100 ng/ml) for 1 hour and subsequently irradiated with UVA (2J/cm²). They were stimulated with PMA, ionomycin and monensin for further 5 hours. 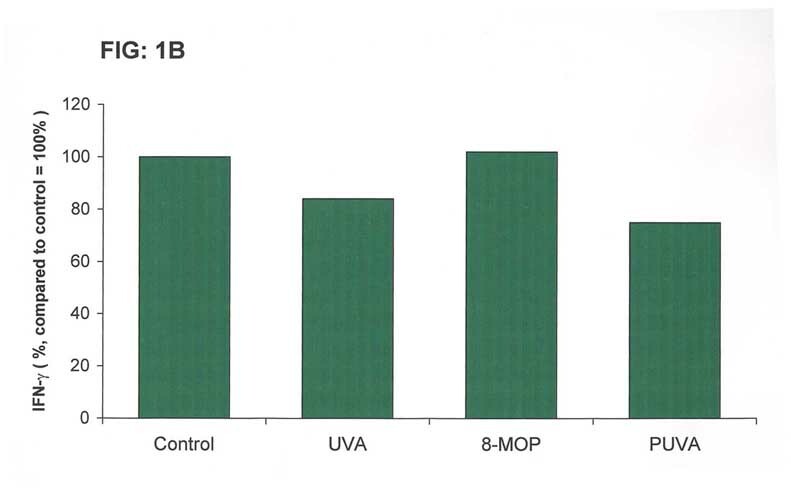 Control cells were treated with 8-MOP, UVA alone, or were left untreated (control). A: FACS analysis represents simultanous staining of PBL with anti-CD4 mAb (APC or PerCP, abscissa) and anti IFNg, anti IL-2 and anti IL-4 mAb (FITC or PE; ordinate), respectively. 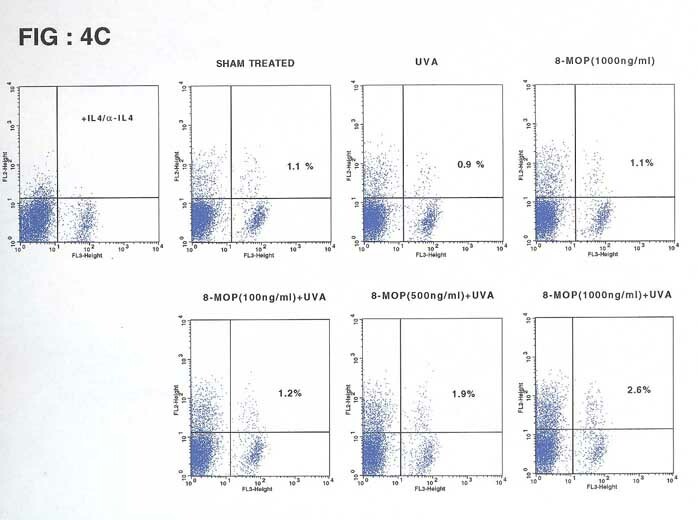 B: Results are given as % of cells positive for the respektive cytokine (as analyzed by flow cytometry), compared to the number of cytokine producing cells in the control determined as 100%. 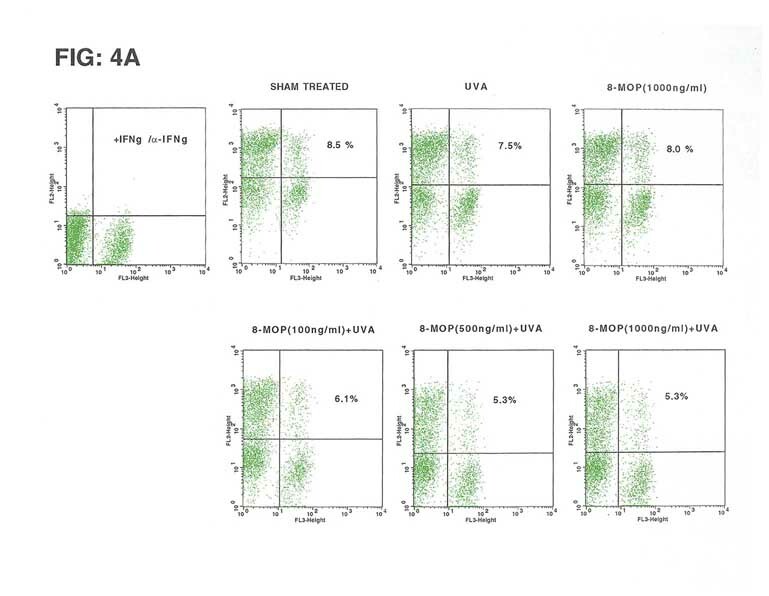 These data show that PUVA treatment in vitro downregulates the expression of THl derived cytokines such as IFNg and IL-2 and upregulates TH2 derived IL-4 in CD4+cells. lt has to be determined whether the induction of a shift from TH1 to TH2 cytokine profile plays a role in the response to photochemotherapy in inflammatory and malignant skin diseases such as psoriasis, atopic dermatits, and cutaneous T-cell lymphoma.